Article first published as TV Review: 9-1-1 on Seat42F. 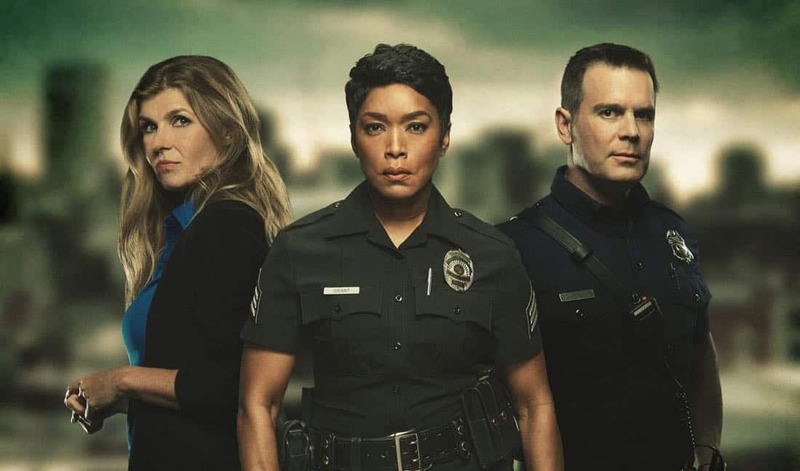 Before watching, one can be forgiven for dismissing the new FOX series, 9-1-1, as a typical procedural. After all, it stars firemen, police women, and EMTs, and the people they help don’t carry over from week to week. But there is a lot more to it than that, even if it’s hard to define exactly what the quality is that it exudes. Let’s try to break it down, shall we? First, there’re the brains behind 9-1-1: Ryan Murphy, Brad Fulchuk, and Tim Minear. These guys are known for a variety of high-quality cable shows in recent years, most notably American Horror Story, American Crime Story, and Feud. Given those credits, it’s hard to believe they would deliver anything at all close to a run-of-the-mill, case-of-the-week series. And they do not. The next clue that this will be better than usual are the actors who signed up. Angela Bassett (American Horror Story, Olympus Has Fallen) is Athena Grant, the main police person we see in the cast. Peter Krause (Parenthood) is Bobby Nash, the fire captain. Kenneth Choi (Sons of Anarchy, Last Man on Earth), Aisha Hinds (Underground, Dollhouse), and Oliver Stark (Into the Badlands) all play characters who work for Bobby. Connie Britton (Friday Night Lights, Nashville) is a 9-1-1 operator named Abby Clark serving as go-between for all of these people, making it a rounded series. While it’s true that none of them have spotless resumes, to have so many great performers in one series says something. The premise itself does feel a bit formulaic when described. In the pilot alone, the characters respond to several calls for help, and deal with the issues. One of the ensemble gets in trouble at work for acting inappropriately, one is a recovering alcoholic, and Athena is dealing with marital issues with husband Michael (Rockmond Dunbar, Prison Break). None of these things sound like they belong to a new, promising show. However, there is something more to 9-1-1 that transcends the formula. It’s an ineffable element that is hard to define completely. The best way I can describe it is that there is an urgency, a pacing and tone, that belongs on a high-quality cable show, and feels very out of place on a broadcast network. No scene comes across as cheesy, everything is done with sincerity, and when paired with the performing talent, it rises above the sum of its parts. The primary thing I can say is that numerous bits of the pilot moved me deep in my gut. I welled up, but not in the way This Is Us makes me. I experienced adrenaline rushes, but not as I do when watching 24. I was scared, but not like a bad slasher flick evokes. I really felt the emotions the characters were feeling, and I have to say, that is quite a feat to do in an hour procedural, let alone multiple times. Maybe it was the mood I was in, but having just reviewed a terrible show right before it, I don’t think so. Some will dismiss this assertion and find it ridiculous. Everyone is entitled to their own opinions, and I’ve already seen some negative reviews of 9-1-1. But I loathe crime procedurals and watch far too much TV to think I haven’t become desensitized. What I can tell you is that this one feels different. This one makes me eager to watch more. It might be the best show FOX has aired in years, and I don’t think that’s making a questionable boast. This is what a procedural should be, the best of its genre. 9-1-1 airs Wednesdays at 9/8c on FOX.